Last night my husband and I were sitting in the living room watching the Kentucky basketball game. I am not a big basketball fan, but it was a very good game as it went into overtime. However, our cat, Motorboat, did not find it interesting…ha ha. 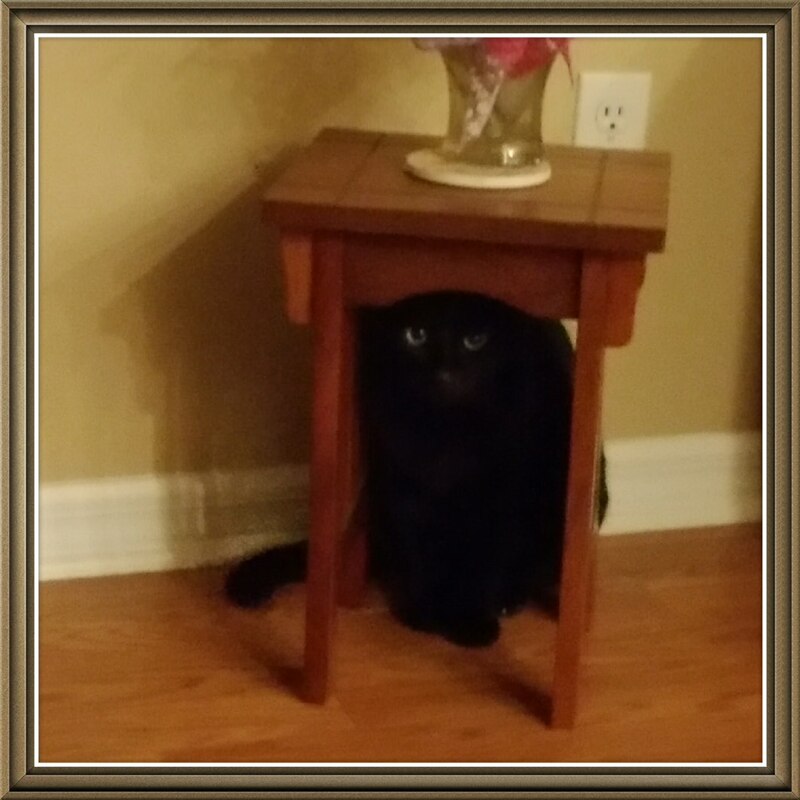 In fact for some reason we found him hiding under one of our small nestle tables. Of course we could see him! It reminded me of the times I try to hide from God…pretending He doesn’t see my actions or that He is not aware of my heart. Of course He can see us! Of course He knows what we are feeling in our heart. Don’t be afraid to talk with Him about your feelings…about whatever you are trying to hide from Him. God wants to be involved…be a part of your life. GET OUT FROM UNDER THE TABLE!! Stop hiding and meet God…BE REAL with Him. Adam and Eve hid back in the garden. And as Dr. Phil would have asked them, “How’s that working for you?” So ask yourself, how is hiding working for you?? I speak from a position of experience…the last couple of months I have tried to hide from God about a certain situation. HIDING, SUSAN? HOW’S THAT WORKING FOR YOU? —- ANSWER…Not so hot!! So I have FINALLY been able to pray about it and talk with God about it. At first I had to ask God to give me the want to, to want to, to want to…to even start to pray about it. I finally have the “want to”…and now…NOW I say, I am able to pray to God about it and stop HIDING from God. This may make absolutely no sense to you if you have not been in a similar situation. But for those of you that are running from Him and trying to “figure” it out on your own…STOP!! Ask Him for the “Want to”…He will provide..He will meet you where you are…He did for me! !